I loved the mystery, the not knowing, the not completely understanding what was happening experience that was “Lost”. I loved talking about it with other fans and reading about it on blogs. Yes, I was a total “Lost Nerd”. And I have missed “Lost” since it went off the air a few years ago. Okay, so this is a stretch to write about walking zombies on a website devoted to walking but it works for me. 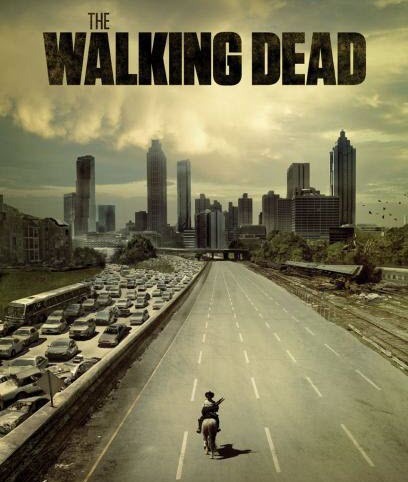 The Walking Dead is filmed in Atlanta so I heard a lot about it long before I ever watched it. We would hear news stories like “the Square in Marietta and all streets leading into the Square and around the Square will be closed while they are filming the Walking Dead” or “don’t go near the CDC today because they will be shooting a scene from the Walking Dead.” These news stories got me curious about what this show was all about. Did I mention that when they showed all these street closings on the news they also showed hoards of zombies walking around? I am not a huge Stephen King fan but “The Stand” was one of my favorite books ever. It is, to this day, the longest book by far that I have ever read and it has stayed with me far longer than most books I have read. I was living in New York and reading it while I was riding the subway to and from work every day. Every time someone coughed, I would start to panic. The Walking Dead reminds me of The Stand – the bleakness, the weary survivors, empty buildings and homes that were abandoned in a hurry and the world being divided into two groups one clearly good and the other clearly evil. The Walking Dead can be a little graphic so it is probably not something everyone would like but for me it gives me something to think about when I am taking one of my daily walks. What would I do if the world suddenly changed so drastically? What would I do if I were thrown together with a bunch of strangers knowing or not knowing if I would see my family again? What would I take with me if I had to leave suddenly? See I knew I could tie “The Walking Dead” into an article on walking!